Bedford lies fifty miles north of London, in what used to be Bedfordshire but is now some mishmash of unitary authorities. It flanks the River Ouse, which makes a particularly scenic sweep through the town, and is about as good as it gets pretty-wise. Bedford's not really on the tourist trail, although the local council would like to think it is, and have a few treats up their sleeve for you. I visited three at the weekend, which I probably ought to have done when I lived here, except one only opened last month, one used to have an admission price and the other I once thought was too far to walk. Towns all across Britain are at it. A newly-created arts/heritage facility with a one word title, probably the name of somebody important like a benefactor, built with the aim of boosting the town in the national psyche. Bedford's opened in June, bringing together the former art gallery and museum in a multi-million pound revamp. This had been the Cecil Higgins Art Gallery, so the new venue is called The Higgins, in honour of the brewing dynasty who left much of their art collection to the town. Several years have been spent knocking things through and sprucing things up, and now the general population are returning to see what's what. Outside is a new cultural quarter named Castle Quay, after the mound of earth which is all that's left of Bedford's medieval fortress. That and a scrap of wall uncovered from beneath a car park, which takes uninspiring pride of place outside a row of mostly empty restaurants. It must have looked a good bet pre-austerity, but The Higgins is the only attractive proposition hereabouts. Entrance to the galleries is free, and there are a fair few to explore. First up is Settlement, which is the usual parade of historical artefacts from ice age fossils to medieval abbey parts. Nobody's got round to labelling the exhibits yet - it's on the list of things to do - which didn't impress one lady of the shires who was visiting. "Oh I don't like how they've done that, and that's not very clear is it, and ooh what a gorgeous piece of stonework." Adjacent is the art gallery section, which underwhelmed me but only because I was expecting more. Two rooms of local-project-work, plus just one of Pre-Raphaelite masters from the Cecil Higgins archive hung round a semi-gloomy cuboid. Meanwhile upstairs is a substantial gallery self-deprecatingly entitled 'Somewhere in England', that being the town's secret identity when the BBC moved all its music and religious programming here during WW2. Here Bedford's multifarious industries are celebrated, including brickmaking, tractor manufacture, Cardington's airships, Texas Instruments and even Meltis Berry Fruits. As a once-local, I was intrigued. I can already tell you've switched off, because this is a municipal museum in a provincial town which you have no intent of visiting. But there is a classy section, non-geographically-specific, which might draw you in. For starters the Higgins family's Victorian house has been restored and filled with period furniture and middle class ornaments. 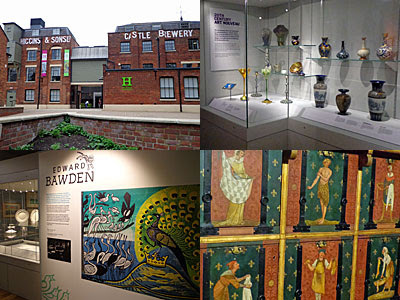 A whistlestop tour of 500 years of 'Design' then features some impressive glassware and ceramics across several rooms. Another gallery features the amazing gilded furniture of William Burges, the extravagant Gothic revival designer who lived at Tower House in Holland Park (now owned by Jimmy Page of Led Zeppelin). And then there's a permanent gallery devoted to Edward Bawden, the much-loved 20th century illustrator who donated his entire archive to the Cecil Higgins when he died. This summer the room hosts an exhibition of his Aesop's Fables ensemble, plus a series of line-drawn newspaper adverts to delight. Bedford's most famous son is John Bunyan, the nonconformist preacher the town once locked up for 12 years. His Pilgrim's Progress used to be the second best selling book in the world until JK Rowling came along, and has never been out of print since 1678. The story is an allegory following Christian's journey via the Slough of Despond to the Celestial City, crammed with characters with transparent names such as Hopeful and Hypocrisy. It's not going to set your Kindle alight, but many still come from all around the world to see the locality Bunyan disguised and made famous. The museum is located just round the back of The Higgins, adjacent to the Bunyan Meeting Free Church. The lady on the front desk seemed either surprised or delighted to see me - I think delighted because the museum was by no means empty. Upstairs a guide tried frantically to wave his hand in front of the motion sensor that would make John's waxwork effigy speak, which was almost eventually worth it. I saw the flute John made from a chair leg to pass the time in prison, and his Civil War sign-up papers, and finally got to follow the plot of his best-selling linear novel. Plenty to see, in not much space, and an illuminating circuit. 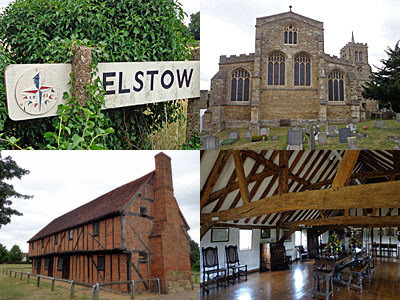 Bunyan was born in the village of Elstow, a mile and a half south of Bedford town centre. It's not a lovely walk, until the path opens out to a half-timbered high street just before the ring road. Here I bumped into a wedding party waddling along the pavement from the one remaining pub, their nuptials at the free church rather than the 11th century abbey. On the village green is the Moot Hall, which Bedfordshire Council chose to restore for the Festival of Britain in 1951 (its logo remains on the village sign in the High Street). This two-storey building was a 15th century marketplace, and opens these days only for a few hours on summer Saturdays. Downstairs is a Bunyan-packed exhibition space, while upstairs is a wood-beamed vaulted room filled with 17th century furniture. I was the only visitor, I suspect the only visitor all day, and I fear my £3 won't go far. Meanwhile at the tea gardens round the back of the Abbey a dozen sweetly-laid tables sat empty, waiting for non-existent tourists to order milkshakes, lunch and cakes. But then we're not a nation of day-trippers any more, we'd much rather be shopping or poking Facebook or hunting for a coffee. Sure, you won't be coming to visit Elstow and its Moot Hall any time soon. But if we all think like that, will its treasures still be open for future generations to enjoy?